Free customization! Add your park or community name! 25 characters/spaces maximum. Standard colors are Red or Green, custom colors for an additional charge. 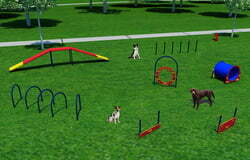 Whether your dog park is big or small, there's sure to be room for Wall Jumps. 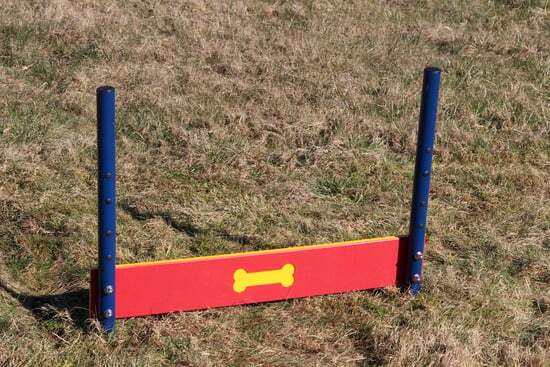 They're available in three different heights to help dogs of various sizes and ability levels develop timing and jumping skills. Like all jump activities, start at the lowest height and slowly work up to the greater heights. 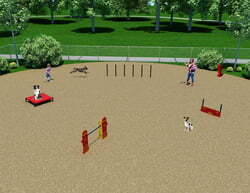 Avoid overdoing things at first or you may discourage your dog from attempting the higher jumps in the future. Be sure to guide your dog over the jump and between the extra-long guide poles. This will help teach him to go over it instead of around (which is missing out on the fun)! 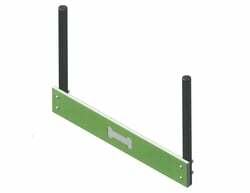 Wall Jumps consist of one, two, or three recycled plastic planks mounted to guide posts. The three-foot-long planks are created from post-consumer recycled polyethylene plastic (milk jugs, shopping bags, etc.). Paw print and dog bone details are precision-engraved on each plank for added depth perception. Guide posts are made with heavy duty aluminum pipe and feature a baked-on polyester powder coat finish. Features vandal-resistant, stainless steel hardware.